Partly cloudy skies. Slight chance of a rain shower. Low around 45F. Winds SSW at 10 to 15 mph. Dwight McNeill, husband of Brian Noyes, founder of the Red Truck Rural Bakery, puts out cake samples at New Market Library on Saturday. LEFT: Brian Noyes, founder and owner of the Red Truck Rural Bakery, hands a signed copy of his business’ cookbook to Barbara Whistler at the New Market Library on Saturday. ABOVE: Dwight McNeill, husband of Brian Noyes, founder of the Red Truck Rural Bakery, puts out cake samples. NEW MARKET - The Red Truck Rural Bakery helped revive a small Virginia town by tapping into basic, human needs - cakes, pies and granola. Founder and owner Brian Noyes runs the popular bakery he started in Fauquier County in 2009 and spoke to a crowd Saturday at the New Market Library, recalling how he switched careers from magazine writer to entrepreneur. 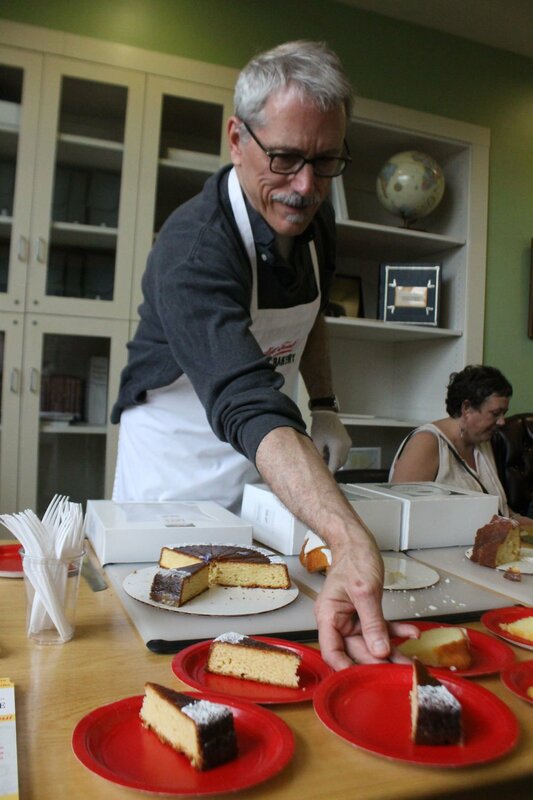 Noyes also promoted his bakery's cookbook and offered samples of cakes to the audience. Noyes helped revive Marshall, an unincorporated community in Fauquier County smaller than the town of Warrenton, his friend, Alan Henry, told the crowd in his introduction of the business owner. Noyes said he grew up in Monterrey, California in a “newspaper family,” his father selling ads for the Monterrey Peninsular Herald. Noyes added he helped out at the newspaper through high school. He went on to work as the art director for a weekly newspaper in Southern California. Then he joined a magazine company that moved him to Tampa, Florida, where he helped launch a publication for George Steinbrenner III. His uncle would return the recipe with red ink marks suggesting how he might improve the taste, Noyes said. He and his uncle later worked together when he moved to Florida, Noyes added. A wheat bread they made together remains a product in Noyes’ bakeries. After Steinbrenner closed the Tampa magazine, Noyes continued to work with the mogul at other publications. Later, Ben Bradlee, then editor of The Washington Post, asked Noyes to help start up the paper’s new Sunday magazine. Noyes also worked as art director for the National Historic Trust’s preservation magazine and, later, the Smithsonian magazine. Noyes recalled thinking then as he neared 50 years old that he wanted to do art design for himself rather than another company. Noyes said he also always wanted to run an eatery and thought he should pursue that idea. Noyes bought a farmhouse and the truck that featured in his business and on the cover of his cookbook. “After being an art director I knew I had to have an old red truck with an old red farmhouse,” Noyes recalled. Noyes found the red Ford truck online and bought it through a company in New York. Noyes noted that Tommy Hilfiger had owned the truck and sold it through the company. Noyes started baking out of the farmhouse on Friday nights after leaving work at The Washington Post. He’d then load up the truck with his baked goods that he would take to a small store in the community. “Pretty soon people were waiting out for the store to open up on Saturdays for that red truck to show up loaded with pies and breads and quiche and granola,” Noyes recalled. A food writer for The New York Times wrote a story about the bakery. Following the publication of the article, hits to his business website increased substantially, Noyes said. Demand for his product pushed Noyes to move his operation to a former Esso gas station in downtown Warrenton that he renovated. The business grew and the bakery needed to use vacant spaces down the street, he recalled. Noyes opened a second location in downtown Marshall in 2015, among vacant storefronts, in a former pharmacy with a Masonic lodge above. Noyes combined the building with a former tavern next door to make the second bakery roughly four times the size of his Warrenton location. The business started with a handful of workers and now employs almost 50 people. Noyes said he does not plan to open a third location. “I was a little nervous during our renovation ‘cause nobody was going by - a kid on a bike once a day maybe, and then just, you know, traffic through Marshall just streaming through,” Noyes recalled. Noyes went on to say he thinks the bakery helped to spur “a renaissance” in Marshall, at least food-related. A group opened the Whole Ox butcher shop nearby in 2011. Noyes’ friends, who used to run the Ashby Inn in Paris, opened Field & Main Restaurant across the street. “That’s why you should be coming to Marshall,” Noyes said of the restaurant. An organic market soon moved from Middleburg next door to the bakery, Noyes said, adding that he wanted the restaurant to be named the Candlestick Maker. Most of the storefronts in Marshall are filled, Noyes said. The bakery continues to thrive as it provides goods to customers in the community and across the country. The business owner took questions from the audience before signing copies of his cookbook. Those who attended also received samples of several cakes made by the bakery. Shenandoah County School Board chairwoman Karen S. Whetzel, who lives in New Market, said after Noyes' presentation that she recently stopped by the bakery on her way to Manassas because she saw the sign on the highway for the business and knew about the event at the library. New Market resident Barbara Whistler said she's known about the bakery for years. A family member who lives in Warrenton brings a dessert from the bakery each holiday gathering, Whistler said. She commented on Noyes' decision to switch careers. "You gotta follow your heart," Whistler said. "I think he ended up where his heart was - in the country baking."